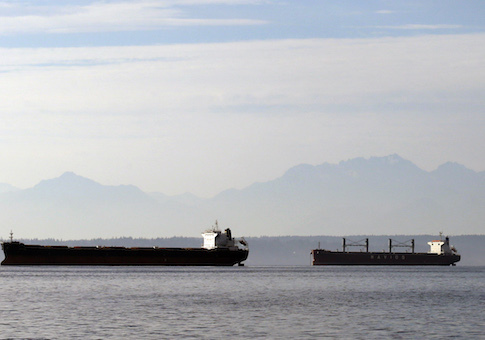 Cargo ships waiting to be loaded with soybeans and corn at nearby Pier 86 are anchored in Elliott Bay, and in view of the Olympic mountains behind, in Seattle. Business groups are accusing the longshoremen’s union of causing a log jam at two Washington state ports over a contract dispute. The Pacific Maritime Association, which represents 70 shipping companies, says that the International Longshore & Warehouse Union (ILWU) is “crippling” the Ports of Tacoma and Seattle, which handle 16 percent of all imports. “We have been told that ILWU business agents sent the slowdown orders out late last week,” PMA spokesman Wade Gates said in a Monday release. PMA said the union has “orchestrated” the slowdown and that productivity at the ports has plummeted in the last few weeks. The ports are running 40 to 60 percent slower than normal business operations, according to the PMA. The union has also purposefully failed to meet the labor needs to run the ports, according to PMA allegations. “ILWU is not filling orders for skilled workers, including straddle carrier operators who are critical to terminal operations. This is like sending out a football team without the receivers or running backs. You can’t run the plays without them,” Gates said. The ILWU called the allegations a “bold-faced lie” in a release. While the union acknowledged the slowdown, they said that it reflected changing business models for shipping and a shortage of equipment and personnel necessary to quickly unload containers. “Congestion at key ports is the result of three factors—some of which is from employer mismanagement, according to industry experts,” ILWU spokesperson Craig Merrilees said in a statement. The ILWU, which represents 13,600 workers at west coast ports, and the PMA have been engaged in a six-month contract dispute, focusing on wages and work conditions. The ILWU’s existing contract expired in July. “The threat of a west coast port shutdown is creating high levels of uncertainty in a fragile economic climate which has forced many businesses to once again undertake contingency plans that come at a significant cost to jobs and our economic competitiveness,” the letter says. Business groups learned the hard way that port conflicts touch every facet of the economy. The west coast port shutdown in 2002 “cost the U.S. economy $1 billion a day.” The NRF says that the costs would double to $2 billion per day as America enters the holiday season. The union said that PMA’s public statements jeopardize the chances of reconciliation. The PMA said that a temporary contract would speed up the process, but that can only happen if the union does not sabotage productivity.